From a polo-themed brunch to an Indo-French inspired ‘Gayatri Devi invites Marie Antoinette’ vibe for the mehendi, Varshini and Rohit's wedding in Jaisalmer was as exotic as the venue. The sprawling ramparts of the historic Suryagarh Jaisalmer heritage hotel got a dash of color as Rohit and Varshini's three-day wedding celebrations, orchestrated by Shaadi Squad, got underway with interesting themes, standout decor, Rajasthani performers and a mandap setup in an ancient stonewell on the property. 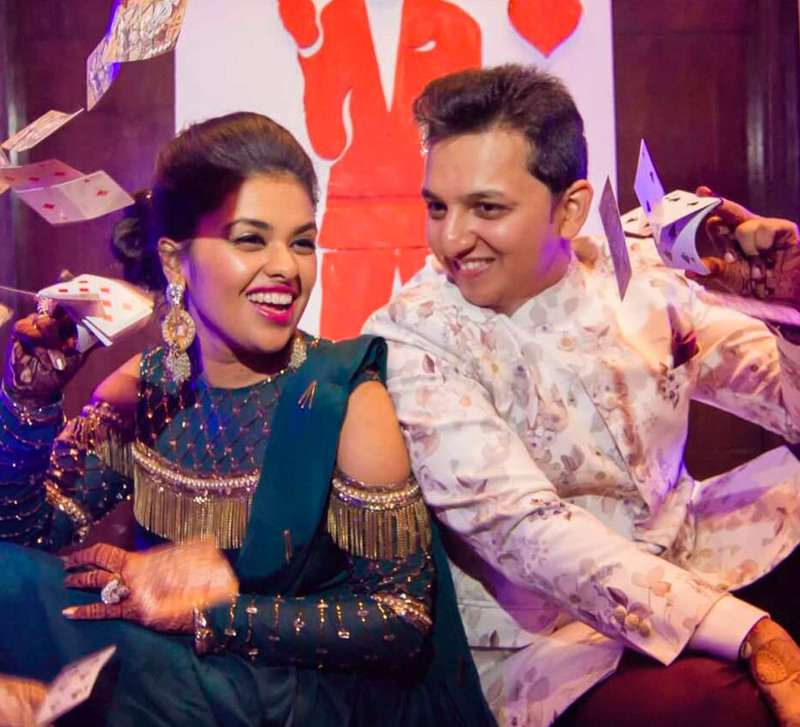 Here, bride Varshini shares some beautiful memories and highlights of the festivities. “We wanted something away from the hustle and bustle of city life. After considering many options in Jodhpur and Udaipur, many people recommended that we check out Suryagarh Jaisalmer. With culturally rich interiors, the palatial property exudes unmatched elegance. Their event spaces morph the best of nature with the best of luxury and present a fairytale setting. We were delighted by the staff's warm hospitality and decided to host our wedding there. Looking back, we couldn't have made a better decision!" “Wedding planning felt so much easier with the Shaadi Squad by our side. Keeping in mind our personalities and preferences, they meticulously planned each function. While Jaisalmer proved to be a stunning venue for the wedding, a lot of planning and logistics needed to be taken care of due to the sheer location. A 30-member hospitality team was flown in from Mumbai to run the show. They had an array of entertainment in place as well; a Karnatic band from Chennai, traditional Nadaswaram, Nashik Dhol from Pune, a percussionist from Mumbai, a Hyderabad based DJ and a saxophonist from Paris! "The wedding celebrations kickstarted with a polo-themed Welcome Brunch for all to meet and socialize. The concept stemmed from Rohit’s love for the sport, and the decor did complete justice to it as well. 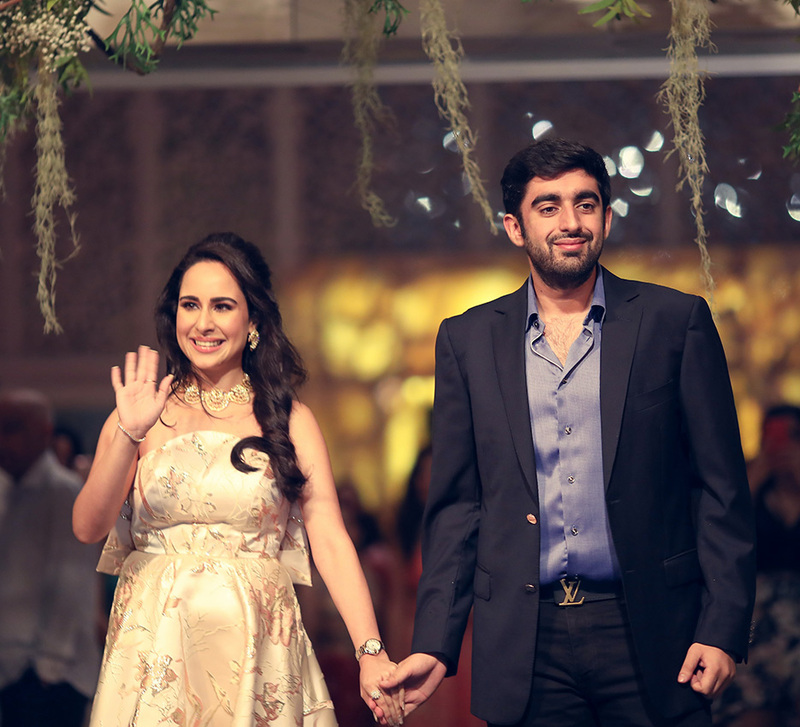 I chose to wear a caped outfit by Anamika Khanna while Rohit donned a suit for this event." 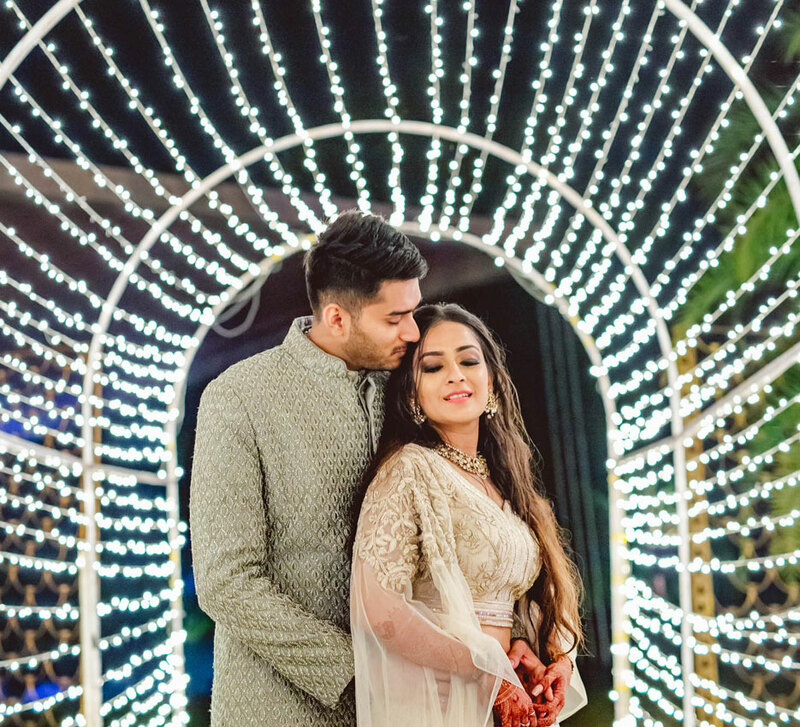 "The Welcome Brunch was followed by a sangeet which was adorned with ‘Elements of Sabya.’ My pearl white ensemble was from Manish Malhotra, and Rohit looked suave in his outfit by Shantanu & Nikhil." "We hosted our haldi ceremony on the next day, which was then followed by 'nalugu' (traditional Telugu wedding ritual where a couple is smeared with turmeric and oils), during which Rohit and I sought blessings from the elders. 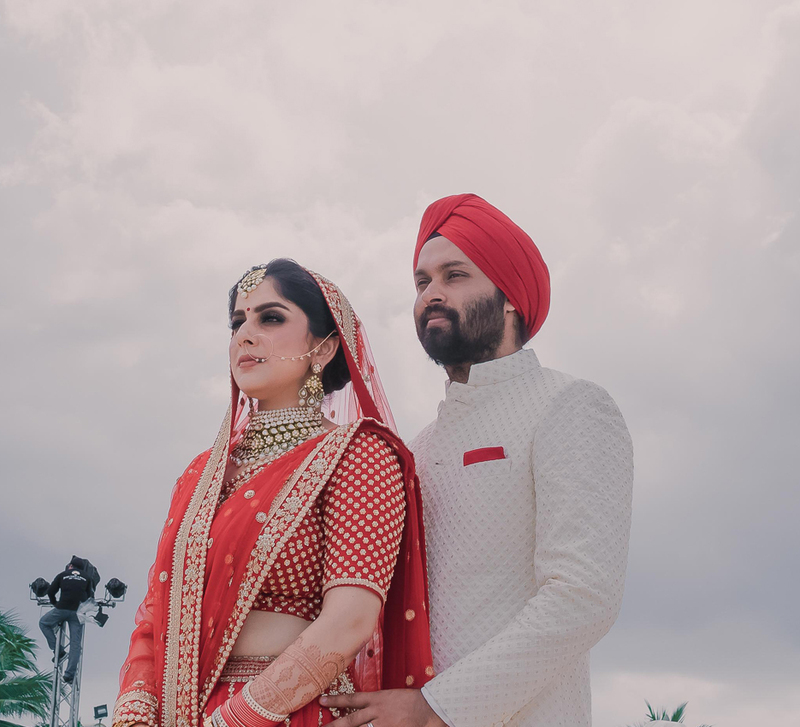 Going with the theme of the ceremony, ‘Textiles of India,’ I wore a Raw Mango Banarasi lehenga for this ceremony, and Rohit chose a kurta by Kunal Rawal." "For the big day, both Rohit and I wore Sabyasachi Mukherjee ensembles. A botanical concept was followed for the ‘green and white’ decor, and our mandap was set up at a picturesque 'bawdi' (stepwell) at Suryagarh." "We hosted our first reception at Hyderabad, for which I wore a feathered outfit by Falguni Shane Peacock. With massive chandeliers, elaborate drapes and elegant centrepieces, the décor for the evening amazed with a royal and glamorous touch." "Our second reception was held at Chennai. The décor, with vibrant florals and suspended light bulbs, oozed an understated elegance. And as for our attire, while Rohit picked a classic black sherwani from Sabyasachi Mukherjee, I chose a Kresha Bajaj ensemble for this last function."